This year I seem to have an overabundance of comfrey. After drying a bucket full, making salve and ointment, selling a bunch of the plants and giving some away, I still have what seems like a mountain. What to do with it? I started doing some research and found that it’s been used as a compost for many years, as well as being a healing agent and livestock feed. Comfrey is a member of the Symphytum genus, which includes the most commonly used Symphytum x uplandicum, or Russian comfrey. It is a large herb, often reaching 4 feet tall. It has white to purple bell-like flowers that bloom in the early summer and can keep blooming for a long time after. It is a favorite with bees and hummingbirds. This alone makes it worth having in any garden. The root is a thick, dark fibrous carrot-like tuber. It is very brittle and breaks easily. If you transplant, be prepared to get all of the root. Any small pieces will root and form new plants. I have them everywhere now. As far as compost goes, you can’t get any better than comfrey. That thick root “mines” nutrients from the soil and contains them in the leaves. Iron, manganese and copper all can be naturally occurring minerals in your soil (depending on where you live) that may not be available to your plants. Here in the Appalachian Mountains we have iron in the soil, but the soil is too acidic for the iron to be of any use to the plants. I could add lime to the soil to raise the pH, but then some of my other plants would suffer. So in reading about comfrey, I found that the nutrients in the soil are transferred into the leaves. Now I chop the leaves and use them as a side dressing for the plants. Comfrey leaves break down quickly. They will usually be found a few days later covered with a white mold. Don’t get rid of it! This is mycellium, which helps to break down the fibrous parts of the leaves. It will turn black very soon and leach those nutrients into the soil along with protein, potassium, and nitrogen. 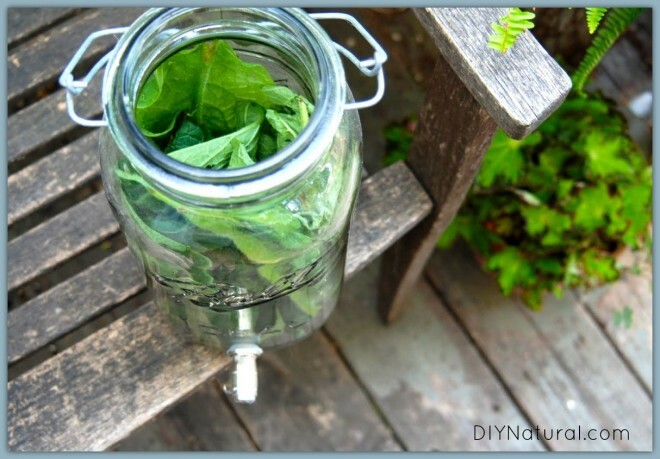 Fill the 5 gallon bucket about half full with chopped comfrey leaves. You don’t need to chop them, but they will break down faster. Weigh them down with a large rock and fill the bucket with water. I use rain water or distilled because there are no undesirable elements like chlorine. Let sit for a few days. You’ll notice a black sludge forming and the smell can be offensive. (This is normal, and indicates the proteins are breaking down.) Cover the bucket if you wish. In a few weeks you’ll see that the color has turned greenish brown and the smell is less noticeable. 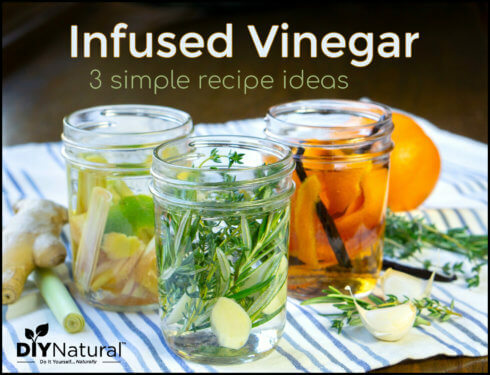 Strain the liquid into a jar and label in. Use it within a month. The leftover sludge can be tossed into the compost pile. 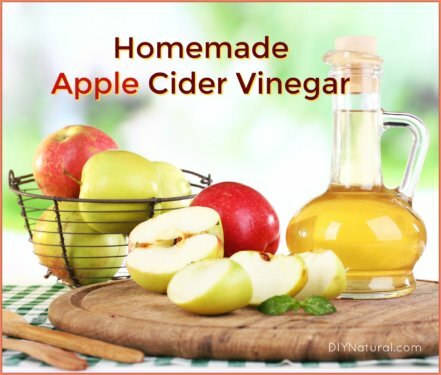 To use the liquid, dilute it about 10:1 (or 15:1) with water. Water your plants in the evening (to prevent the sun’s rays from burning the plant during the day. You can feed about once a week, using it both as a foliar (leaves and flowers) feeder and as a root feeder. If you wish to feed more often, dilute it more. We had a saying as Master Gardeners: “Weakly, weekly.” This means to dilute to twice the amount of liquid, but feed twice as often. Because comfrey is rich in protein, nitrogen, and potassium, it’s great for any green plant, such as trees and shrubs, and garden plants such as herbs. For root crops and those dependent on flowers for fruit, such as tomatoes, you’ll need to add some phosphorus, such as bone meal. This will help stimulate the roots as well as the rest of the plant. The comfrey root can also be dried and used in infused oils and soaps for irritated skin. To make a solar infused oil, dry and grind the root into small pieces. Place a few cups in a quart jar. 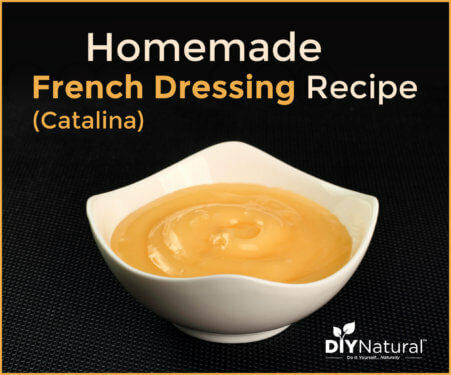 Cover with a neutral oil such as grapeseed, sweet almond, or safflower. Leave in the sun for a few weeks and shake daily. This allows more of the healing compounds in the comfrey root to be released into the oil. When it’s ready, and you can tell by the darker color and earthy smell, strain and use the oil as you wish. The remaining plant material can be tossed into the compost. The small amount of oil will not harm beneficial bacteria. When I make comfrey salve or ointment, I always end up with stems, flowers, and yellowed leaves that I can’t use. These go into the compost as well. And now that I’ve seen what they can do, I chop a small amount of plant material and mix it with my garden or potting soil. It breaks down and helps feed new plants with much needed nutrients. I have a large patch of banana plants in my yard. They don’t produce fruit but are pretty to look at and they provide much needed shade for my greenhouse during the summer. However, bananas are susceptible to root nematodes, and what do nematodes love? Poor soil! I have an abundance of that with thick clay. Now each spring before my bananas break the soil surface, I start throwing on the comfrey leaves. As a result, they are now (as of June 1st) over 4 feet tall and spreading like nuts. If you’ve ever had gardenias fail to thrive or not flower the second or third year, this may also be the problem, as nematodes love gardenias too. Just amend the soil adding some comfrey leaves and they’ll do much better. 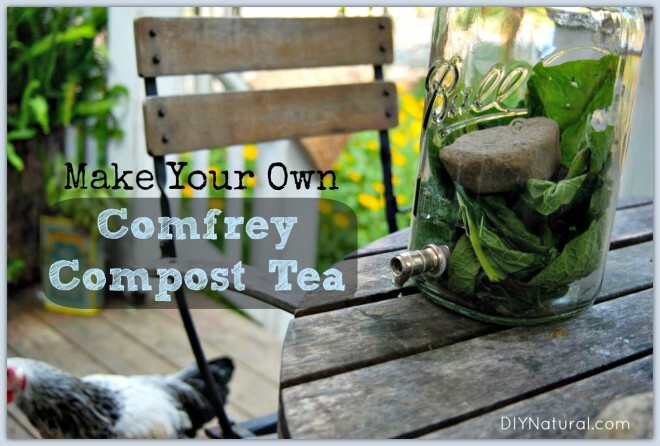 Have you used comfrey compost? Tell us how it worked for you. Last year I tried to start comfrey seeds in trays for use in my compost pile. For some reason I couldn’t get them to sprout! Maybe I should buy plants to begin with? Any suggestions on growing comfrey? whether this comfrey root is available ? Is it Indian herb? I would plant Comfrey by my mini-donkey’s pen. When the flies would be really bothering them in the summer they would eat it. It helps with the swollenness from the fly bites. I would recommend for anyone who has horses or donkeys to plant some near their pastures or barn. They loved it and it sure helps the fly bites heal fast.